In that traditional American sprit of entrepreneurship, more and more people today are setting up their own small businesses: be it in a leased office, in the garage, or in a spare bedroom. And with every small business, there is a need to keep expenses down while you’re starting up. 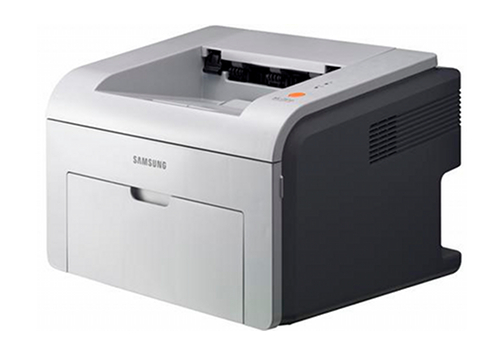 The older sibling to the ML-2510, the Samsung ML-2570 offers higher resolutions for sharper B&W prints, more print memory, and decent paper capacity, all packaged in a neat, compact size. This monochrome laser (that’s what the “ML” in ML-2570 stands for), occupies an area just over one square foot on your desk or shelf. This laser can accept a range of paper weights from 16 to 43# for both paper trays, giving its owner a wider range of paper choices than some other printer brands would allow. However, for manual 2-sided printing (you’re flipping the paper over yourself) use 20-24# weight paper to save yourself some grief. When you flip open the door on the front of the ML-2570, it reveals the 250-sheet paper tray. The single-sheet manual feeder is above the main paper tray, for printing labels, cards, and transparencies (and make sure to use transparencies that are “laser printer safe”). The main tray can handle a variety of sizes: from postcard (3” x 5”) to legal (8.5” x 11”). The ML-2570’s larger paper and toner capacity makes it ideal for people who rely on printing throughout the day or an office having multiple computers sharing a single printer. For such an affordable laser printer, the ML-2570 prints extremely fast. After the initial warm-up time, letter-size paper prints at 25 pages per minute, making this one of the fastest of the ML 2000 series. Having a maximum resolution of 1200 x 1200 dpi, the ML-2570 is great for printing text and B&W photos. The Toner Save feature, only available in it’s 600 x 600 dpi resolution, still produces printouts that are clear and readable. For small-press desktop publishers using Wintel machines, Samsung’s software CD gives advanced printing features, like booklet printing and large-format poster creation. Sorry Mac and Linux users-- you’ll have to find those features in whatever publishing software you are using to get the same results. As your business grows, the ML-2570 will still be able to meet your print needs. With 32MB of non-expandable RAM, the ML-2570 can handle larger print jobs and multiple jobs (if shared or networked with an optional adapter). Understanding the printing needs of today’s businesses and the software applications and suites they often use, Samsung has installed PostScript and PCL6 emulators, as well as their proprietary SPL. It’s nice that Samsung recognizes there are other operating systems than the one from Redmond. Samsung provides software support for the “Big 3” (Windows, Mac OS, and Linux). Now you don’t have to be chained to one operating system just because your printer can only support one. An external network attachment will give the ML-2570 the ability to be a network server. But without a way to increase the printer’s memory, the ML-2570 will struggle with simultaneous job requests. For the cost of the network attachment, you can upgrade to a more powerful network printer. In start-up, wake-up, and in operation, the ML-2570 produces 53 dB of sound, and 35dB of noise in standby. Think of 53 decibels as the sound of low conversations and 30 decibels as a quiet office. While 53 decibels may not be loud, it is if the printer is sitting next to you chugging off 50 pages. The ML-2570 has a 25 second wake-up delay, with a 9s delay between print jobs. A long delay when you turn on the printer in the morning isn’t a big issue, but the ML-2570 goes automatically into a power-saving sleep mode when it’s inactive. Add all this up and the 25 ppm speed boost is lost with all the delays. 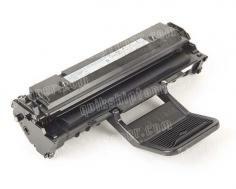 Review it: "Samsung ML-2570 "
A big disappointment is the ML-2570 ships with a toner cartridge that’s only 1/3 full. This so-called “starter cartridge” prints about 1000 pages, or 2 reams of paper. So it might be a good idea to go ahead and buy the full yield toner the same time you buy the printer. The ML-2570 will use the same toner cartridge as the ML-2010, with a standard yield of about 3,000 pages, or six reams of paper. The Samsung does not offer a high-capacity toner for the ML-2570. 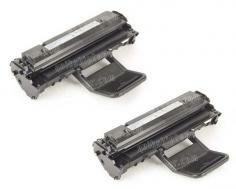 ML-2570 (ML2570) 2Pack of Toner Cartridges - 3,000 Pages Ea.